I have been living in an Arab suburb of Jerusalem (or, Quds). The first day I was here the landlords invited me for coffee. They built their house here over 30 years ago, with room enough for a growing family. About ten years ago a mosque was built only 50 yards away. Speakers on the minaret broadcast prayers to the neighbourhood, and on Fridays that includes the sermon as well. I asked my landlord what the sermon was about. He grimaced, indicating he doesn’t listen. We have coffee just about every week; every week he comments on the loudness of the prayers. Eventually he told me that the sermons often have anti-Christian and anti-Jewish content. The Christians in the community feel the volume is so loud purposely to annoy them. I have been trying to understand what it is like to be a member of a minority faith in relation to the majority faith. Here Christians are a double minority—both among Jews and among Muslims. While Muslims are the majority in the Palestinian context (with 1% of these being Christian), they in turn are the minority in the Israeli context (about 30%, and a Christian population of 1.5%). By comparison, the Muslim population of the UK is reported to be about 4%. What one feels keenly as a small minority is the barriers that communities raise between each other. I began my reflections on Israel/Palestine in this Blog by speaking of the mental maps that people bring with them to Israel/Palestine, and how those maps affect what they see. In this, my last blog from Jerusalem, I consider the walls that are built by the various communities. The most obvious wall here, impossible to ignore, is the barrier built by the Israelis between Israel and the Palestinian Territories during the Second Intifada. 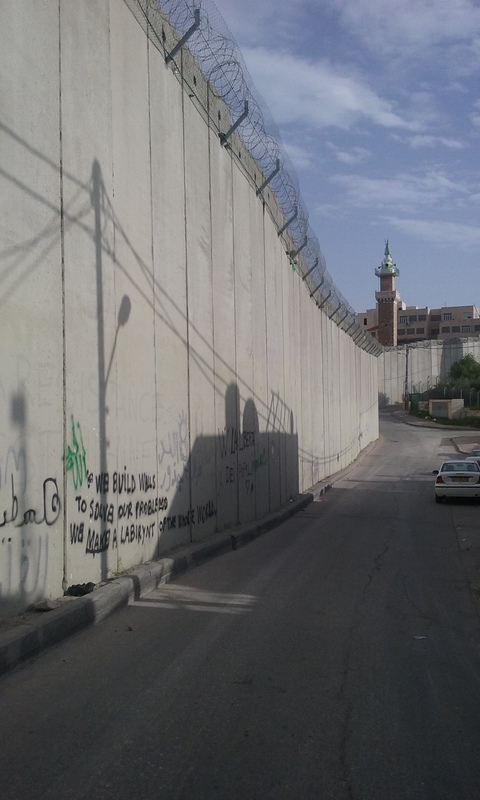 The very terminology used for this wall is an example of how everything is contended: for Israelis, it is a ‘separation’ wall, using the same term used for the central median on dual carriageways, or ‘security’ wall; for Palestinians it is the ‘apartheid’ wall. At checkpoints large signs in red lettering warn Israeli citizens that it is against the law to go beyond the wall/fence. Palestinians seeking to enter Israel face mountains of bureaucracy to gain entry papers, then stringent searches at the checkpoints. This physical barrier separates the communities, and prevents people from mixing or meeting one another in every day settings. But there are other walls, or barriers, that are not as visible or easily detectable, and which are just as impermeable. There are the barriers of race, tribe, language. But overall is the barrier of religion and sect. These barriers appear on both sides of the wall. Jews, Muslims, and Christians create barriers between each other—and amongst themselves. This is not a phenomenon unique to this land, of course—but it is, perhaps, keenly visible in ways not always observable in the West to the majority populations —and the examples here are illustrative of the sharp divisions that shape the conflict in Syria and Iraq today. The ‘sound’ barrier in my neighbourhood separates my Christian landlord from his Muslim neighbours. In a conversation with a Palestinian Christian teacher I was told that schools are still using textbooks introduced when Hamas was in the Palestinian Authority government, and that these included anti-Christian material. Nazareth is the largest Arab city in Israel. The population is 65% Muslim, 35% Christian. I am told there are good relations between the two groups. On my recent visit my host received many warm greetings from Muslims as we walked along the street. He told me, though, that they simply do not talk about religion. That is how they get along. 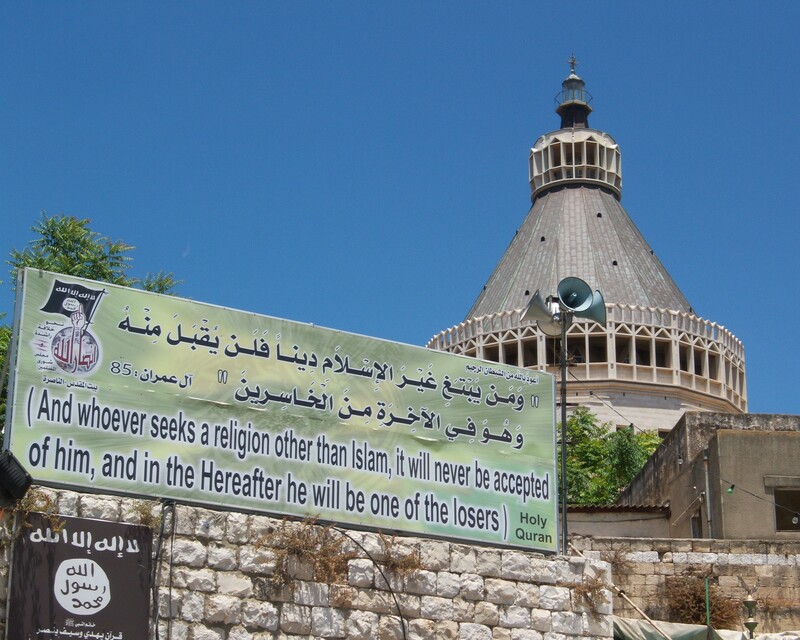 The sign posted in front of the Church of the Annunciation, however, seems a rather blatant antagonism: ‘And whoever seeks a religion other than Islam, it will never be accepted of him, and in the Hereafter he will be one of the losers’ (Qur’an 3:85; see photo). 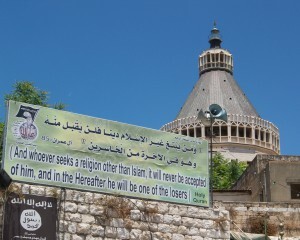 Traveling through Jordan and Lebanon I have found similar barriers of religion. My hosts regularly identified the village or the neighbourhood we came through as ‘Christian’ or ‘Sunni’ or ‘Shia’, or ‘Druze’. As conflicts continue, there seems to be an increasing clarity of demarcation between these identifiers. The religious identification inhibits social mixing—not simply in every day discourse, but in the choices of where to live and go to school. This discussion focuses on religion as a major barrier placed between communities. This is a reflection of the extent to which religion has become the focal point of identity in today’s world. The Israeli-Palestinian conflict is not primarily religious, but political and even nationalist. The same may be seen in other conflicts. But since 9/11 everything is viewed through the lens of religion. This is the world in which we now live, and while the solutions to conflict must address the political, nationalist—and economic—sources, they cannot ignore the role of religion. It is easy to spot the barriers of others and to overlook those we ourselves erect—it is easier to see the speck of dust in the other’s eye than the plank in our own. It seems particularly difficult for a majority group to empathise with minority groups—rather than to be irritated with them for not being ‘like us’; for not assimilating to the majority. In our conflicted world, the great barrier between communities is fear. We see the Other, the one not like us, the immigrant and refugee, the person of a different colour or nationality or faith, as a threat to our routine lives and to our security. This fearful Other tends, in the West, to be Muslim. Out of fear we erect further barriers—silence, hostility, discrimination, ignorance. Barriers prevent understanding, enhance suspicion, and perpetuate themselves when we hide behind them. If there is to be any hope of an end to the bloody conflicts of our time, it has to begin with the breaking down of the walls we place between ourselves, and with the necessary effort of trying to understand each other. When we do this, we are likely to discover our common humanity, our hopes and desires for a peaceful and secure life in which our families may thrive. From such ‘common ground’ we can then work at understanding how to live with our differences. The great challenge of our time is to learn how to live together with our differences. MCSCI exists to advance this purpose.